Faith and Theology: Readings in theological ethics? 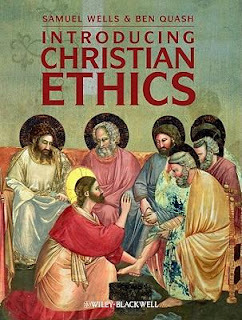 Next semester I'll be teaching an undergraduate class in theological ethics. So I'd welcome your thoughts about good texts in this area. At the moment, I'm thinking of using Richard Hays's The Moral Vision of the New Testament (1996) as the tutorial text. (My preferred approach is to assign a single book for the tutorial discussions; then the students also have a range of additional short readings on each weekly topic.) One of the advantages of Hays's book is that it models the whole process whereby ethical thinking springs from an immersion in the moral world of the New Testament – otherwise, class discussions could easily degenerate into free-floating expressions of opinion and sentiment. So anyway, I've started developing a list of various books and essays to use for shorter readings – I'd love to hear your own suggestions. And if anyone out there has used Richard Hays in an ethics class, I'd love to know if it worked well, or if you have alternative suggestions for class discussions.